Physical Description Estrad's bright deep blue eyes are in stark contrast to his rich black hair, making for a striking appearance. His traditional Trill spots are usually extremely visible going down the side of his face, as he keeps his hair trimmed and smart. He walks with a casual relaxed swagger, and keeps his clothing loosely kept on his body, even when he's on duty. General Overview With the experience of his two past hosts inside him, he offers a confident, relaxed, almost scholarly first impression. But those who speak to him will find him to be open, honest, friendly and always willing to put others before himself. Dagan has just over 200 years of experience underneath him. Ambitions Estrad focuses his attention on the present, and always like to make the best of the current moment. He is happy where he has got to, and his only ambitions are to ensure he does his best at what he puts his mind to in this new job. Estrad Ozi was born and raised in the town of Alakisa, a small district in the northern hemisphere of the planet Trill. He was quite quiet and reserved, and had only a small group of close cut friends. At home, he was always friendly and willing to help, and became extremely close friends with his younger sister, Susi, who absolutely adored him. Susi was always a bright, eager spark, eager to try everything and anything, and Estrad often found himself being brought along on random adventures Susi would concoct, take him into the nearby fields and pretend they were deep in the mysteries of space, which although Estrad played he didn't really share the same enthusiasm as his sister. At the age of 12, he participated in Trill's mandatory genetic testing, and found that he was suitable for joining. When, in two years time, his sister took the test, she found that she was not. Knowing this, she quickly put her mind to trying to persuade Estrad to join, as she knew he could be better then he already was. As they grew older, Estrad's friends changed, and as they changed they moved on; until his only true friend became his sister. His sister also grew up, and began to get interested in making a difference to the world around her. She decided to pursue a career in medicine and become a Trill doctor. At the age of 14, Estrad applied to be joined, and he was accepted later that year, to begin his training the following year. However, later that summer, shortly after he hit 15, he got involved in a fight. As Estrad and his sister were walking down the road, some random teenagers attacked them in an attempt to force Susi on the ground. Estrad responded with force, engaging in a bloody fight that got him beat up pretty badly. Luckily enough, a Trill police unit saw the fight and moved to intercept. Everyone on the scene was arrested, but Estrad was released after it was found he responded in self-defense. The following week, the Symbiosis Commission called him up. Estrad seriously thought he had lost his place, but the commission had heard of the way he had stood up to protect his sister, and said that the only thing they hadn't seen in him was his confidence to protect and help others, as he had been quite overly reserved in their questioning. Estrad was accepted into the commission and began a seven year training session in order to prepare for the joining. During this time, he kept close correspondence with his family. At the age of 22, he was selected to be joined to Dagan. Maci Dagan (previously Maci Zilnch), female. First host to the Dagan symbiont. Maci was a jazz musician who played the saxophone and became a popular musician on Trill. Known for her generosity and open spirit, and for her many concerts on many worlds. Faris Dagan (previously Faris Cardron), male. Second host to the Dagan symbiont. 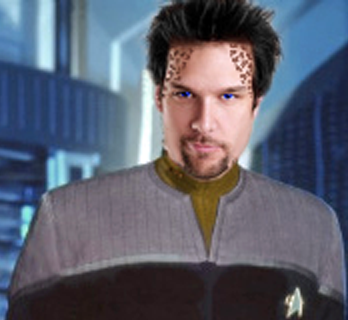 Faris joined Starfleet soon after becoming joined and had his first posting as an engineer on the USS Merigold. He served on the starship for five years before being transferred to the USS Gallico for two years, the USS Exeter for three years, and the USS Rabin for just one year, all as engineer's, and rising up to Lieutenant in the process. This constant transferring between starships ended with his final transfer to Starbase 14 as Assistant Chief Engineer and a promotion to Lieutenant Commander. He served on the Starbase there for the remainder of his career, a full thirty more years, becoming the Chief Engineer after his first nine years, and then becoming station commander with the promotion to the rank of Commander after twenty years on the station. Following this he retired to Trill and spent the remainder of his years living there, until he passed the symbiont to Estrad. Following the joining, he became far more confident and self assured of who he was, while still maintaining his eagerness to please others. He also became quite fond of the saxophone, from one of his previous host's experiences and her enjoyment from it. But the biggest change, and this came from both his own and his previous host's experiences, was his desire to go into space; just as he had done before, and as his sister and he had acted out. On his return home, his sister noticed he was very different, but also the same. When Estrad inquired if she liked him better this way, she just smiled and said that he'd taken the best parts of the host and mixed them with the best parts of him, and that she was happy for him. That put Estrad at ease. He then set out and registered for Star Fleet, and was allowed in after passing the entrance exam first time. He spent four years at the Academy once accepted, where he excelled in all the engineering classes. He graduated at age 26, and immediately applied to serve on a starship. He spent four years on the USS Goldberg, a Nebula class ship, as an Ops Officer, rising in rank to Lieutenant JG, before being offered a transfer to the USS Apollo as Chief Engineer on the ship. He served there for a full three years, before being transferred to the USS Dalton as Executive Officer. A full five years later, and he departed to become Commanding Officer of the newly constructed USS Aeon.